Esan Wiltshire (left) and Ryan Harper proudly display their country flag shortly after carting of the top prizes. 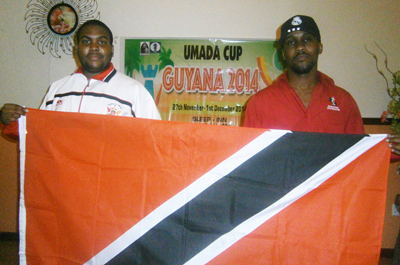 respectively and carted off the top prizes in the Open and Challengers’ Cup Category when the finals of the 2014 Umada Cup Chess Championships concluded at the Sleep Inn Hotel, Brickdam, Stabroek, last evening. For their efforts, the two players from the Land of the Humming Bird ‘flew off’ with US$2,500 and US$1,500 first prizes. Harper defeated his countryman, Kevin Cupid and Jamaican Lorne Malaku. Orlando Husbands closed off the championships with ½ point less than Harper after defeating Chris Guzman (DR) and Martin Del Castilo (Bar), while Visnu Singh (T&T) and Christopher Guzman both amassing 5 points apiece with the former player earning the nod on the tie break system. Wiltshire dominated the Challenger’s Cup category after amassing 8 points and carted off the US$1,500 first prize. His victims were Guyanese, Anthony Drayton and Jamaican, Andrew Mellace; the latter player had earlier defeated Avikaar Malgie and closed off the tournament on 7 points to take the second place and the US$1,000 that went with it while Guyanese, CM Anthony Drayton and WIM Deborah Carter both amassed 6 ½ points and shared the final podium spot and the US$750 prize. After conceding his first game to Wiltshire, Drayton proved that he is made of sterner stuff when he played a quick fire game to register a win against his nemesis, Muesa, in just 33 moves which aided greatly in his final placing. In other results, Maria Varona Thomas, conceded her first game to local National Champion, Wendell Meusa but rebounded with a decisive victory over Aditi Soondar Singh (T&T) to close off on 6 ½ points. WCM Deborah Richards (Jam) drew her first game with Frank Lo Kim Lin (Sur) before defeating Avikaar Malgie (Sur). Davion Mars (Guy) won both of his games against Calvin Finkie (Sur) and Ishvar Ramlall (Sur). CM Ronuel Greenidge (Guy) drew his first game with Mikel Martin (T&T) then replicated the performance against his countryman, Loris Nathoo; Kriskal Persaud (Guy) and Joel Frijde (Sur) played to a draw before the former player defeated Keith Simpson (Guy) in the final game. Haifeng Su (Guy) defeated Reyna Frijde (Sur) then drew his second game with Frank Lo Kim Ling (Sur); Geryen Dos Ramos (Sur) defeated Errol Tiwari (Guy) and replicated the feat against Trinidadian, Mikel Martin. Tiwari then drew his second game against his countryman, Rashad Hussain. CM Frank Sears (T&T) lost to Loris Nathoo then drew his game with Roberto Neto. Jessica Clementson lost to her Guyanese counterpart, David Khan then played Calvin Finkie (T&T) to a draw. President of the GCF, Irshad Mohamed congratulated the winners and participants and hoped they enjoyed the warm hospitality, while Allan Herbert represented the FIDE President and echoed congratulatory sentiments. He said that the UMADA is one of the tournaments that serves as a unifying force in the English speaking Caribbean. He further disclosed that FIDE had budgeted for a five year span of the tournament and that period is now expired. Mr. Herbert also intimated that plans towards the renewal of sponsorship would be known by the first quarter of the New Year.